Officers and men alike had worked hard during the nine months before the first action with the enemy. The work had paid dividends in several ways. First the ship had become a fighting unit, capable of meeting whatever the enemy or the weather had sent her way, second she had settled down into being a "happy ship," willing to take the long tedium of cruising for months on end with no sight of the beach and no excitement beyond that occasionally provided by the laps. 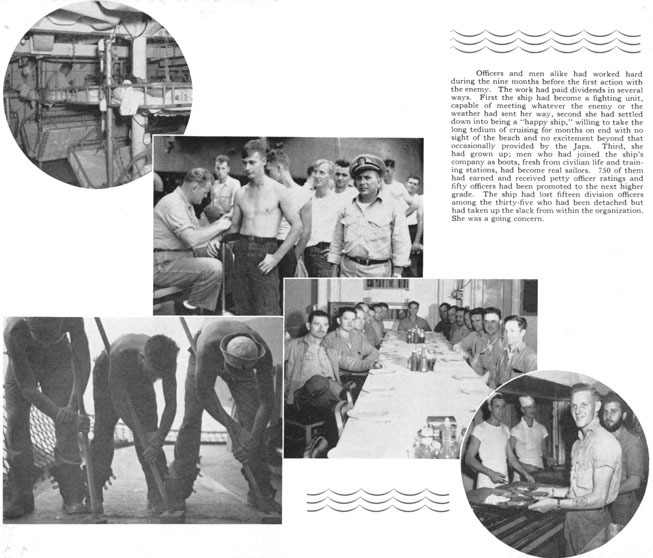 Third, she had grown up; men who had joined the ship’s company as boots, fresh from civilian life and training stations, had become real sailors. 750 of them had earned and received petty officer ratings and fifty officers had been promoted to the next higher grade. The ship had lost fifteen division officers among the thirty-five who had been detached but had taken up the slack from within the organization. She was a going concern.